Last night’s episode of 60 Minutes featured an interview with Jeff Bezos, CEO of Amazon. The timing was perfect for Amazon. Black Friday was a few days ago. Cyber Monday is today. Online retailers want to be top-of-mind when people are inclined to spend money. 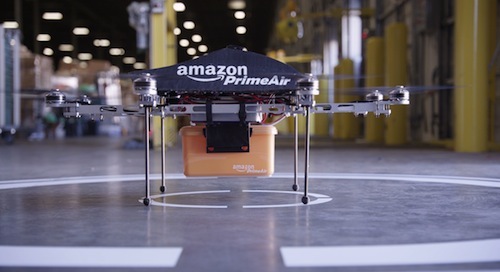 Bezos unveiled a surprise for interviewer Charlie Rose: Amazon Prime Air, a service that will deliver most Amazon products in thirty minutes or less using a fleet of octocopter drones. Buzz. Everybody is talking about Amazon on Cyber Monday. Political influence. Some of the people feeling the buzz are FAA officials. Continued top-of-mind awareness. Long after Cyber Monday, the excitement of the drone idea will carry on. Congrats to the Amazon team for a well-executed Guerrilla Marketing move.